The Fairdale Library reflects the Library’s commitment to lifelong learning and serving as an educational and cultural anchor in the Fairdale community.The free-standing 7600 square foot building more than doubles the capacity of the original branch. The library employs state-of-the-art technology, has a large children’s section, and makes use of energy efficient and green building methods and materials. The new library houses more books and computers, a private study room, small and large community meeting rooms, and plenty of chairs and tables for quiet research and study. From Snyder Freeway - Take the New Cut exit and turn toward Fairdale. If you get to the Outer Loop, you have gone the wrong way. Go 1.4 miles and you will see the Fairdale Library in front of you. Turn right just before the library, then left into the parking lot. From I-65 - You can take the Fairdale/Okolona exit and turn right toward Fairdale. Go about 5 miles until you see Wendy's on the right. Turn left at that corner. This is also New Cut Road. Go 1.8 miles - you will see the Fairdale Library in front of you. Turn right just before the library, then left into the parking lot. After a local petition drive, the original Fairdale branch of the Louisville Free Public Library opened in July 1974. The branch served the community for six years out of a second floor room at Fairdale High School. However, due to budget reductions, the Fairdale Branch closed its doors in August of 1980 along with three other locations. Determined to keep a library in the community, local volunteers maintained a small lending library that mainly consisted of donated materials. The volunteer library was housed in the Fairdale Memorial Playtorium. Renewed hope for a permanent branch library began to materialize with the construction of a new library facility in the mid 1980s. However, due to budgetary shortfalls, the branch never opened and the building subsequently became the headquarters for the Jefferson County Police Department Charlie District. As in difficult times before, the volunteer group continued to provide a much needed service to the community of Fairdale. After a long wait the community of Fairdale finally received a permanent library branch with the grand opening on May 11, 1998 in the Fairdale Memorial Playtorium. The opening of the Fairdale branch was the capstone project in the Library's five-year plan for service expansion. The branch opening represents the culmination of the efforts of all those individuals involved in the endeavor and it is truly something in which the whole community can have pride. On Saturday, March 24, 2012, LFPL celebrated the grand opening of a new, free-standing 7600 square foot Fairdale Llibrary. See pictures from our opening day celebration on Facebook - click here. 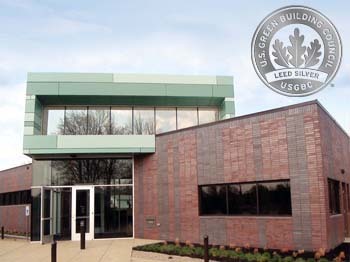 Built with advanced “green” technologies and eco-friendly architectural design, the Fairdale LIbrary was awarded LEED Silver-certification in August 2013. LEED stands for Leadership in Energy and Environmental Design, an internationally recognized green building certification system providing third-party verification that a building was designed and built sustainably and with low environmental impact in mind. The Library’s green features include geothermal heating and cooling, daylight harvesting interior lighting, environmentally-friendly building materials, and energy efficient windows and fixtures. Watch the LEED award presentation - click here.